Confession time: I may have had to make these donuts twice because I didn’t have the patience to wait until morning to take my photos. I couldn’t resist. 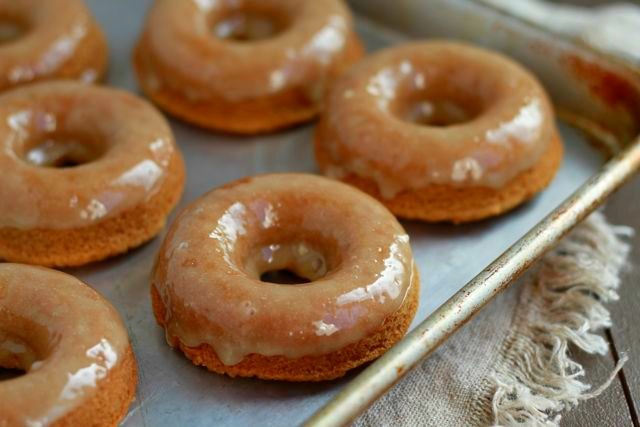 Can’t say that I have been much of a donut eater in my life, but after making these Grain Free Maple Glazed Donuts, I’m hooked. These wildly delicious creations are my first attempt at making donuts EVER. On an impulse, I ordered a donut pan online. I figured I had seen enough donut recipes on PINTEREST that it was time to give it a shot. Oh my goodness! I had no idea. Making donuts is super easy. Dangerously easy. A little protein rich almond flour, a titch of coconut flour, some fresh from the farm pastured eggs, and coconut milk. It was all coming together. Add a little sweetener, and now you’re talking. You can use either coconut oil or ghee. I personally prefer the ghee. But the coconut oil is heavenly as well. Oh, and the glaze. 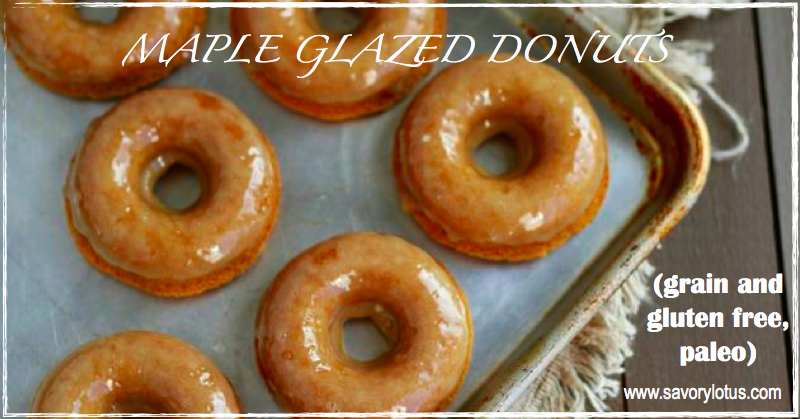 I’m not even going to tell you how mouth-watering the glaze is. Like I said, dangerously easy! Now I’m definitely going to have to get that mini donut pan I was eye-balling. In another large bowl, whisk together eggs, coconut milk, maple syrup, coconut oil, and vanilla until thoroughly combined. Place all glaze ingredients into high speed blender. Process until smooth and creamy. Add more water a tiny bit at a time if it’s too thick to pour. Pour into shallow bowl. 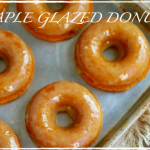 Dip each donut into glaze with a twisting motion to let extra run back into bowl. Place back onto cooling rack. Are you a fan of donuts? Have you ever made your own? mmmm yeah! looks so delish Katja! Where did you find the donut pan? 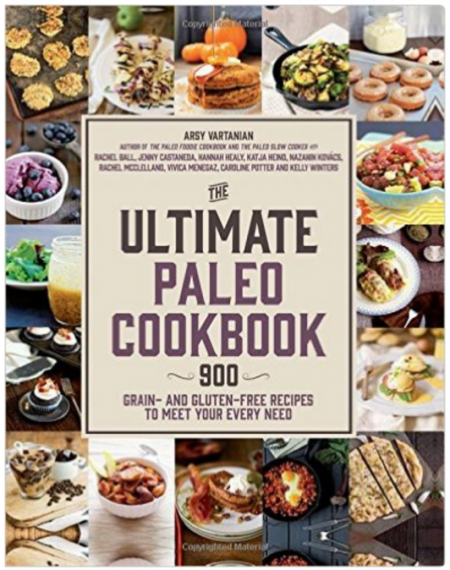 Going to be getting these pans and using your recipe, so excited… and thank you for using the like this links they are so helpful when it comes to shopping, so many places are not Paleo friendly which makes it hard to shop…. How do you store them if not consumed? YUM!!!!!! if you don’t have a donut pan, do you think the dough would work in muffin tins like a popover? Or, just spend the $ on the donut pan? I’m seeing a lot of recipes with raw cashew glazes. I’m allergic to cashews and for now can’t have peanuts. Would another nut work? 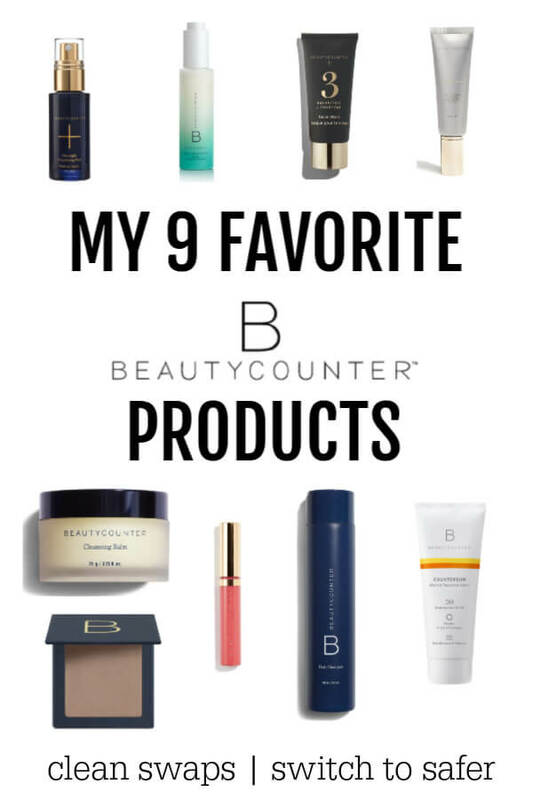 I am really excited to try these! We have recently gone Grain/Dairy free so this will be a nice change up to breakfast which have been mainly eggs or a variation of. Hi Katja. I love your website and recipes, but I’m just wondering if a NON-STICK donut pan is the way to go. I’ve read in many places that they are toxic. What do you think? Ha Ha….you’re right about that! Whenever I use the silicone bakeware, I hate how they flop around…very irritating! These donuts are wonderful! I’m going to be making them again for sure. Thanks for your delicious recipe. Any suggestions for a nut free flour? Maybe just a GF all purpose? My daughter has severe nut allergies, but I would love to try these. They look AMAZING!! Yay you’re back! And with wonderful dontus, too. I love, love, LOVE maple icing (well, maple anything, really). 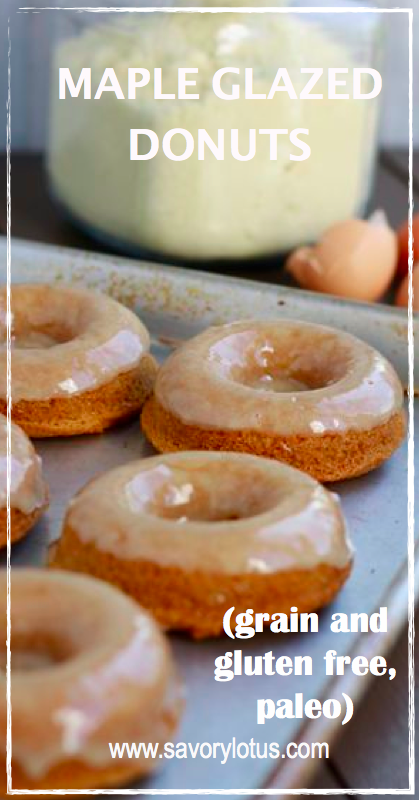 I should give this recipe a try and put my donut pan to use! I’m wondering how this might work as a cake baked in a bundt pan? Perhaps double the recipe? Any thoughts? I found a cast iron donut pan on sale and my husband, an avid donut lover, asked me why I bothered to buy it. Then I made these donuts and now he is begging me for more. See husband, THAT is why I bought it. Fantastic recipe! I have to get better about oiling the donut wells so they come off the pan in a successful donut shape. I did not have any cashews on hand, so I actually substituted with a half cup of almond butter and got a great response from several people who ate them. Thank you! I love cast iron. What a great find! And YES, you do have to liberally oil the donut pan in order to get them out easily. So glad that you enjoyed them. Thanks for coming by! I just made these and the glaze is so white not as clear as yours. I kept adding water to thin it but it never got any clearer. Any suggestions? Hi! My glaze was pretty white. I think that my photos were a certain angle. My coconut butter just may be a bit different than yours. I make mine in my vitamix from shredded coconut. These look awesome and I’m so excited to make them. So excited, in fact, I don’t want to wait any longer to make them. I have everything except the coconut flour. DANG. I do have Bob’s Red Mill AP flour blend. Do you think it would make a huge difference if I used that instead of the coconut flour? It’s only 2 Tbsp but I also don’t wanna mess it up. Thank you for any tips or suggestions there. The recipe looks delicious. I was going to make them but lost my appetite when I scrolled down and saw some disgusting picture of a lady getting eye lid surgery or something in your ads. Lol. I took a screen shot to show you but there’s no way to add a picture in this comment. I know you don’t always know what ads are showing so just wanted to point that out. Otherwise this looks like an amazing recipe! Oh no! So sorry about that. I have an ad agency who runs my ads for me. We try hard to be selective about what ads come through, but I don’t have total control over it. Again, I apologize. Thanks for stopping by! I Just made these and they turned out perfectly my maple syrup was cinnamon flavored so I dusted mine with a little cinnamon after I glazed them. When I turned on the oven I began soaking the cashews for the glaze because mine were pretty dry and I thought it might make them blend a little smoother. I only added 1 tablespoon of water to the glaze because I soaked my cashews and I wanted my glaze to be thicker. Also for anyone interested I substituted unsalted Kerrygold butter for the coconut butter because I didn’t have any you could probably also sub ghee for a non dairy option. It still tasted wonderful. My batch made 7 and I used the large/regular size donut pan. I probably overfilled them slightly and could have got 8 donuts out of it. Great recipe! SO GOOD! Making multiple batches to keep in the freezer as I type. Thank you!!! Oh, yay! So glad you are enjoying them! I made these as mini-muffins because I didn’t have a donut pan. Makes 24 mini-muffins. Only modification was to bake them for 12 minutes. We even like them better without the glaze – just a quick 73 calorie bite-sized bit of yum! How long can they keep if your refrigerate it? Question, you call for full fat coconut milk. Do you blend it if it has separated? Yes, I blend it if it has separated. If it is really separated, I have thrown it in the blender for a few seconds. That works well. My 8 year old daughter and I made these on rainy morning. The recipe was easy enough that she essentially made them by herself with limited guidance. We used a mini donut pan and it made 12 mini donuts perfectly. So delicious and beautiful and fun! Thanks for the recipe. Oh, yay! That makes me so happy. Paleo caramel sounds SO GOOD. Glad you enjoyed them. Hi you link above for full fat coconut milk is going to coconut milk. It’s going to coconut aminos. Just wanted to let you know. Amazing! Just tried these and both of my little guys gobbled them right up. Very moist and delicious, You would never guess there is no flour in there. Oh, yay! Love it! Kids love donuts. My husband did a surprise Uber Eats delivery of Krispy Kreme Donuts for the kids. I’m a type 1 diabetic and eat low-carb and GF/DF, but wanted a donut, too, so I made these. To make them lower-carb I used maple extract, water, and a mix of Erythritol/Stevia instead of maple syrup. I also added cinnamon, 1 tbsp collagen peptides, and 1 tbsp TIU vanilla protein powder in place of some of the almond flour. Even with the changes I made, they turned out exactly as pictured and were only 5g net carbs each. They were delicious with toasted coconut chips crushed on top! My husband even preferred these to the Krispy Kreme donuts, which he said were too sickingly sweet! Thanks for the recipe! Yay! I am so glad that you liked them. Thanks for sharing your subs. Have made these several times now – always a hit no matter what crowd!!! LOVE. thanks!! I found a silicone donut pan (Amazon) that works perfectly. You don’t need to grease it, just pops right out. ? OH!! I may need to get one of those silicone pans. Thanks for the tip! I’m following a low FODMAP diet that eliminates coconut products. It’s challenging! I liked this recipe but my daughter is picky about anything that tastes like coconut, so in the second batch, I switched out the coconut flour with 1 tablespoon psyllium powder and the coconut oil with palm shortening. I left the coconut milk since it isn’t a strong flavor. I also picked up maple butter at Costco and used this for the topping. She approved. Thanks for sharing your subs. 🙂 Maple butter sounds amazing!! Amazing! Made these beauties this morning – fast and simple. Great texture and taste. I used my own “almond flour” from dehydrated nut pulp from making my own almond mylk. Turned out great! Absolutely love the cashew maple glaze. Next time – which will probably be tomorrow – I think I’ll kick up the flavour a notch and double the cinnamon and maybe add nutmeg or pumpkin pie spice and I’ll definitely add cinnamon to the glaze – I like cinnamon. And for fun I just may switch up the maple syrup for raw honey. What are the nutritional facts for this recipe? Hi, Debra! I do not calculate my recipes. But you can use this to figure it out if you want to know —-> https://www.myfitnesspal.com/ Hope that helps! These. Are. Amazing. I actually made the doughnuts, and swapped a chocolate coating for the glaze. Melted 1/3C of Enjoy Life Dark Morsels with .5T of Coconut Oil, and then dipped each cooled doughnut top in that. They are my new favorite treat. Will be making them often – so easy!